Didn't want to do two purples in two days, but I still haven't had a reply from BYS UK or AUS about their packs of mystery unlabelled bottles, and it has been a few days since I wrote, so I'm impatiently sulking by wearing OPI Ink. Yeah, I'm really cutting off my nose to spite my face there. OPI Ink Swatch. Horrible photo, cuticles still freaking out because of ills. It looks a bit gritty, but that was because I was lazy and didn't put on any top coat, whoops. Anyway, this colour, to loosely quote Derek and Clive, it gives me the 'orn. It's a dark purple-blue base with blue and pinky purple shimmer all over the shop, it's three coats of absolutely gorgeous. This is far too nice for Konad. Put some top coat on this time round. 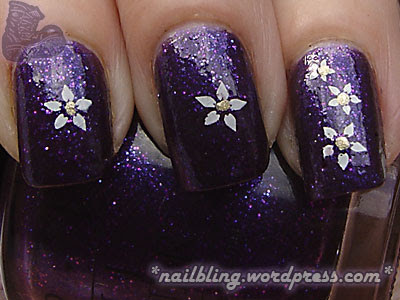 I gave in to the stamper, and gave my lovely purple shimmery nails a little flower each, using part of a flower design Fauxnad m75. 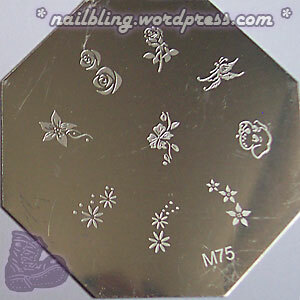 This went on with some Konad Special White polish, and the centres of the flowers were dotted with Collection 2000 Gilded 292 (gold). The ring finger got the full flower design with the same colours. I absolutely love and adore this colour, but, despite this, it'll probably be replaced by something else tomorrow cos I got bored, or something. Meh.